SMC (Sub Miniature version C) Connectors are coaxial RF Connector. SMC RF Connectors are semi-precision, sub miniature devices that Provide repeatable electrical performance from DC to 10 GHz. They offer excellent electrical performance from DC to 10 GHz. Female SMC connectors have a socket for the canter contact, and are therefore analogous to the “reverse polarity” versions of other types of RF connectors. 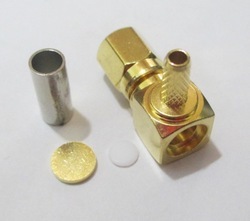 We are operating as the manufacturer and exporter of SMC Male Connector. This connector is provided with threaded system for coupling and is capable of accommodating a wide range of cables with varying diameters. It is ideal for broadband conducting coaxial cables owing to its low reflective property. The connector is dimensionally accurate and is resistant to water and temperature fluctuations.